PHOENIX, Oct. 18, 2018 (GLOBE NEWSWIRE) -- via OTC PR WIRE -- SinglePoint Inc. (OTC:SING) announces the addition of three new products to SingleSeed.com. SingleSeed provides hemp-based CBD products to customers nationwide. With an easy ordering system and quick fulfillment SingleSeed is blossoming into a well-known distributor of many hemp-based CBD products. The new products will include a CBD muscle salve with an easy applicator, a CBD hair and beard oil, as well as a new sleep aid tincture. These new products will be available for sale on SingleSeed.com next week. These products will be directly fulfilled by DIGS, another SinglePoint subsidiary that is able to source and supply bulk CBD from raw to isolate as well as supply and fulfill white labeled products. Recently DIGS has received many requests for bulk CBD as the industry is currently booming. SingleSeed will continue to aggressively expand its distribution services and add additional products. 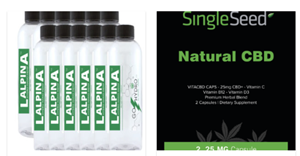 Most recently Lalpina Water became available on SingleSeed and has already received orders for over 200 bottles of the nano technology CBD water. Lalpina is manufactured and produced by American Premium Water Corporation (OTC:HIPH). The two companies plan to collaborate on additional offerings in the near future. SingleSeed is now negotiating two additional distribution contracts which are planned to be completed in the coming weeks. These two contracts will provide SingleSeed access to additional category leading products manufactured in the U.S. in the effort to drive additional exposure and revenue for SingleSeed and its partners. Lastly, SinglePoint has been exploring the potential to dual list on a Canadian exchange. The company has opportunities to enter the Canadian market and is currently researching the viability and scope of these options. Yesterday marked a major day in history with Canada becoming the first industrialized nation to legalize recreational use of cannabis after nearly a century long ban.